Junhong Guo, Guohe Huang, Xiuquan Wang, and Yongping Li. Improved performance of a PRECIS ensemble in simulating near-surface air temperature over China (Manuscript ID: CLDY-D-18-00437), Climate Dynamics (Springer, SCI IF = 3.774), accepted on November 14, 2018. More details will come soon once the paper is published. Xiong Zhou, Guohe Huang, Joseph Piwowar, Yurui Fan, Xiuquan Wang, Zoe Li, and Guanhui Cheng. Hydrologic impacts of ensemble RCMs-projected climate changes in the Athabasca River Basin, Canada (Manuscript ID: JHM-D-17-0232), Journal of Hydrometeorology (American Meteorological Society, SCI IF = 3.790), accepted in November 2018. 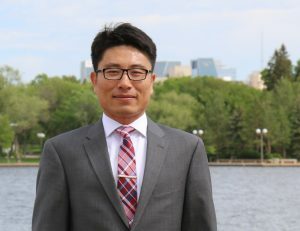 Dr. Wang has been recently invited to deliver a keynote presentation about his latest climate research for China in the 2018 International Conference on Advanced Technologies in Energy, Environmental and Electrical Engineering (AT3E 2018) held at Qingdao, China during October 26-28, 2018 (website: http://www.at3e.net). Photo: Dr. Wang was delivering a keynote presentation at AT3E 2018. Abstract: Spatiotemporal changes in China’s carbon emissions during the 11th and 12th Five‐Year Plan periods are quantified for the first time through a reconstructed nationwide high‐resolution gridded data set. The hot spots of carbon emissions in China have expanded by 28.5% (toward the west) in the north and shrunk by 18.7% in the south; meanwhile, the emission densities in North and South China have increased by 15.7% and 49.9%, respectively. This suggests a clear transition to a more intensive economic growth model in South China as a result of the energy conservation and emission reduction policies, while the expanded carbon hot spots in North China are mainly dominated by the Grand Western Development Program. The results also show that China’s carbon emissions exhibit a typical spatially intensive, high‐emission pattern, which has undergone a slight relaxation (up to 3%) from 2007 to 2012 due to a typical urbanization process. Summary: Implementation of China’s recent climate pledge to the Paris Agreement requires effective carbon reduction policies at various geographical and administrative levels, which will rely on not only accurate estimates of national total emissions but also on a comprehensive understanding of the spatiotemporal changes in carbon emission patterns. The latter is crucial for allocating carbon emission quotas and developing appropriate policies at regional and local scales, yet it remains poorly understood. To this end, we reconstruct the nationwide high‐resolution gridded carbon emissions for the first time by compiling the CO2 emissions from industrial, residential, transportation, and agricultural sectors. This allows us to investigate the spatiotemporal changes in China’s carbon emission patterns during the 11th and 12th Five‐Year Plan periods when unprecedentedly rapid economic growth, technological development, and environmental change have taken place. Moreover, this enables us to quantify the influences and effectiveness of previous carbon reduction policies (up to 3% relaxation to China’s spatially intensive high‐emission pattern and 16% reduction in emission intensity). 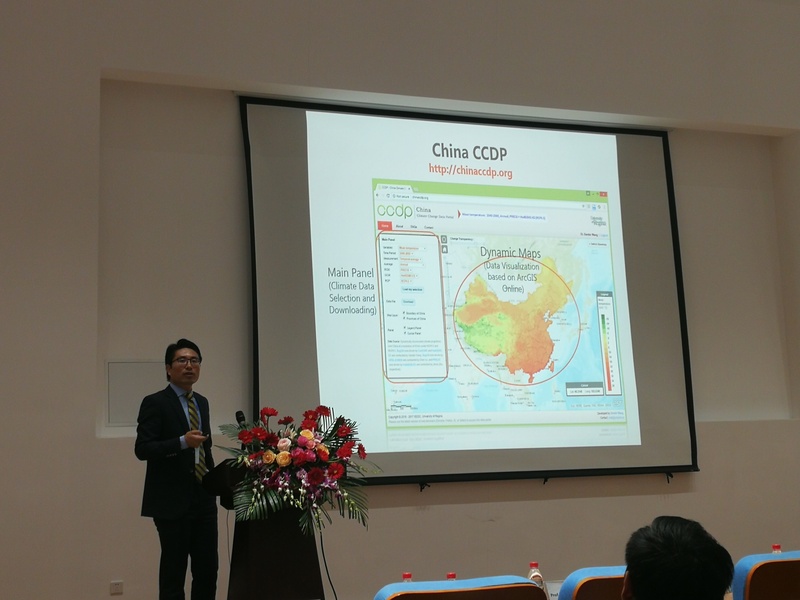 Our findings are of great significance not only for developing evidence‐informed climate policies in the current and forthcoming five‐year planning periods in China but also for providing scientific references to other countries in support of developing effective climate policies. Jinxin Zhu, Guohe Huang, Brian W. Baetz, Xiuquan Wang, and Guanhui Cheng, Climate warming will not decrease perceived low-temperature extremes in China, Climate Dynamics (Springer, SCI IF = 3.774), accepted in October 2018.